Just when her career as a carpenter and a relationship with Will Jamison are within reach, Nila Black’s abusive ex-boyfriend is released from prison. He’s out of jail, out for revenge, and making promises she knows he’ll keep. 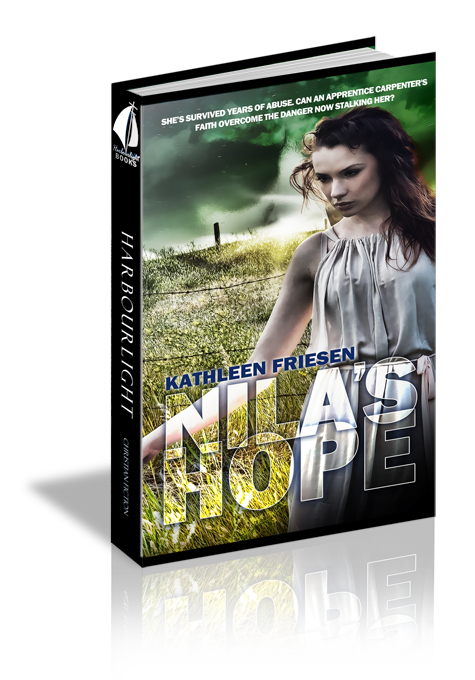 Nila will do anything it takes to save Will and her friends from the evil that will come their way if she doesn’t put distance between them—even if it means abandoning her new-found faith. It will take a miracle and an angelic messenger to show Nila that God is her greatest protector. He has never left her side, and He wants only the best for her and for the man she loves. Nila’s face burned as she untangled the bridal bouquet from her own and slipped it into her friend’s waiting hand. “Introducing Mr. and Mrs. Daniel and Melody Martens!” The pastor’s voice rang with joy. As the recessional music lilted through the sanctuary, the bride and groom turned, clasped hands, and walked down the aisle of the packed church. Best man, Will Jamison, held out his arm for Nila. She slipped her hand inside the crook of his arm and settled her hand onto his forearm. He covered it with his own hand, pulling her close to his side. Perfectly in step, they followed Will’s mother and her new husband down the aisle toward the foyer of the church. “You look amazing.” Will’s breathy whisper caressed her skin. Nila barely noticed the fragrant pine and cedar boughs, decorated pews, broad smiles of the guests, or even the whispered greetings. Her world at that moment consisted of the handsome man beside her, the harmony of their steps, and the warmth emanating from his body to hers. When they reached the foyer, Nila’s world expanded again. She stepped away from Will and embraced his mother. At the same time, Daniel’s strong arms pulled Nila close. “Congratulations, boss,” she said and stepped back. Nila took her place on the other side of Melody as Will released his mother and held out his hand to his new stepfather. Nila cringed and then shivered as the outside door opened and a blast of icy wind and swirling snow swept through the foyer. No one else seemed to notice. People lined up to greet the wedding party, and she had to do her part. Forcing a smile, she held out her hand for the next person in the long line of well-wishers. That old, crushing feeling of “you don’t belong here” stiffened her face as she shook hand after hand in the reception line. The words spoken by others were pleasant, but they didn’t register. Just a few more minutes and it would be over. A male guest she didn’t recognize swept her into a tight hug. She froze as she fought the urge to flee. Why had she ever agreed to this? That was why. She would do anything for Melody. Faith’s puffy eyes and red nose testified to her nasty cold as she struggled to hang onto the squirming baby boy in her arms. She nearly lost her grip as he lunged toward Will. Nila’s heart thumped as she took Tommy in her arms. “You sweetheart,” she whispered. The warmth in her face seemed to work its way down to her heart. She squeezed the little boy in her arms and nuzzled his chubby cheek while furtively watching the best man maneuver his way through the crowd for her. As the wedding party entered the rented hall, guests clapped and cheered, and some tapped their glasses with spoons. Daniel and Melody stopped short, nearly causing Will and Nila to bump into them. Will stared as Daniel bowed to the guests, took his bride in his arms, and pressed his lips to hers until her cheeks turned red. The crowd roared their approval. Melody gazed at her new husband and pressed her fingers to her thoroughly-kissed lips. Daniel looked at their guests and cupped his hand to his ear. They caught the hint and began tapping their glasses again. Daniel grinned at Will and then turned to his bride, pulled her to her feet, and kissed her forehead, nose, and finally settled his mouth on her lips once again. Will squirmed in his chair and stared at his empty plate. He was happy for his mom and Daniel, but man, it was awkward watching them smooch. He wondered how Nila was handling it. He leaned forward until he caught her eye, glanced at the newlyweds and back to her. Nila followed his gaze, and as their eyes met, she touched her lips, blushed, and dropped her focus to the tablecloth. He glanced across the room at his sister. Faith grinned, pointed from him to Nila, and winked. Yeah, she’d razz him for sure. He knew she’d caught him staring when Nila walked down the aisle. But his little co-worker was gorgeous. Who knew? That red dress fit her like a lucky glove, and her hair—what a change. All those curls and little flowers and stuff. Too bad that come Monday morning she’d be back in her overalls and braids. He swung his gaze back to Nila. She was blushing again. Nila squirmed as heat rushed up her neck. For a moment she’d gotten caught up in the romance of the day and imagined herself being kissed. And Will had noticed. She pushed up the long sleeve of her burgundy silk dress and tugged a small paper from under her watchband. As Faith’s husband, Jason, began his master of ceremonies monologue, Nila unfolded the note and tried to smooth out the wrinkles. Her hands were shaking so much she ripped it in half from top to the middle. The servers began bringing their dinner so Nila tucked the torn paper under her plate and clasped her hands in her lap. She wished Faith hadn’t gotten sick. She wished she could be sitting out there instead of in front of everyone. She didn’t want to disappoint Melody, especially today. Too soon, dinner was finished and Jason introduced her toast to the bride. Nila pushed herself upright onto shaking legs and tried not to wobble or spill the juice in her fluted glass. She clung to the podium for support and smoothed out the torn paper. She tried to read her notes, but her handwriting seemed to have morphed into another language. Her hands shook the podium, so she folded them together on top of the useless paper. The silence in the room felt heavy. Nila glanced up. So many people. She opened her mouth, but no words came. Then she spotted Faith sitting at a table near the back. Faith smiled, patted her heart, and put one thumb up. Speak from your heart. Easier said than done. She glanced over at the head table, hearing only the pounding of her heart. Three faces wore encouraging smiles. Nila took a deep breath and cleared her throat. She glanced up. Every gaze was locked on her. Her hands shook again. She quickly looked at Melody, and her warm smile gave Nila the courage to continue. “God used Melody to save me—not only my soul, but my life. If it weren’t for Melody…” Her vision blurred. Nila blinked several times and dabbed at the tears that spilled onto her cheeks. A movement caught her eye. A door at the back of the hall opened without a sound. A head appeared. Glittering eyes stared at her. Hatred sliced across the room and raked her with an icy touch. The figure raised a finger to his lips and shook his head. The message was all too familiar. Nila froze. Black spots filled her vision, and the room disappeared. When she came to, she was back in her seat at the table. She shuddered and looked toward the door. No one was there. Question 1: Nila serves as a last-minute replacement maid of honour for her dear friend, a role that made her quite nervous. Have you ever been asked to step out of your comfort zone to help a friend? How did you respond? Answer 1: 1 John 4:10-11 reminds us to love one another as God loves us. Question 2: Just when she thought her dreams might come true, Nila gets a phone call that turns her world upside down. Can you relate? What happened? Answer 2: Psalm 46: 1. We can trust God at all times and in every circumstances, because He is in control. Question 3: Will's attraction to Nila grows, but so does his frustration at her withdrawal. Have you wanted to help someone, but they wouldn't allow it? How did you handle that? Answer 3: Proverbs 17:17 encourages us to continue to love, even though problems. Question 4: When Pastor Dave reads the words of Jesus in Matthew 6:16-16, Nila loses hope. Do we really have to forgive everything and everyone? Answer 4: Yes. If we don't forgive, we make ourselves judges, taking God's position. Question 5: Nila reads the first part of Psalm 10 and becomes so upset, she throws her Bible across the room. Why is it dangerous to take verses out of context? Have you ever done that? Answer 5: Proverbs 2:3-5. God's word is not an appetizer buffet to be picked at. The more we read it with a prayerful attitude, the more we will understand. Question 6: Will hires a crew to install a security system, but he cannot relax. He feels he must remain vigilant. Is he right, or is he showing a lack of faith? Answer 6: Nehemiah 4:8-10. Nehemiah prompted the people to pray and stand guard when an enemy threatened. God rewarded their vigilance. Question 7: In two different cicumstances a mysterious woman offers Nila encouragement. Do you believe God sends angels to help us? Answer 7: Hewbrews 1:14 states clearly that angels are sent to protect and serve God's children. Question 8: When Nila opens up to Will about her background, he is outraged and wants to lash out. Was he justified? Why or why not? Answer 8: James 1:19-20. Man's anger does not produce righteousness. "Letting off steam" burns those around us. Question 9: Nila is confused by Jesus' words in Luke 12:4-5. What does He mean? Answer 9 As Lydia explains, we are to fear God because He IS God. But that is immediately followed by a reminder of His incredible care (verses 6-7). Question 10: Why did Nila identify with Hagar (Genesis 16)? What was the name Hagar gave to Jehovah and why? How did it encourage Nila? Answer 10: Both women suffered abuse and were essentially thrown away. El Roi means "Jehovah sees me." Nila clung to that as she faced her greatest threat.